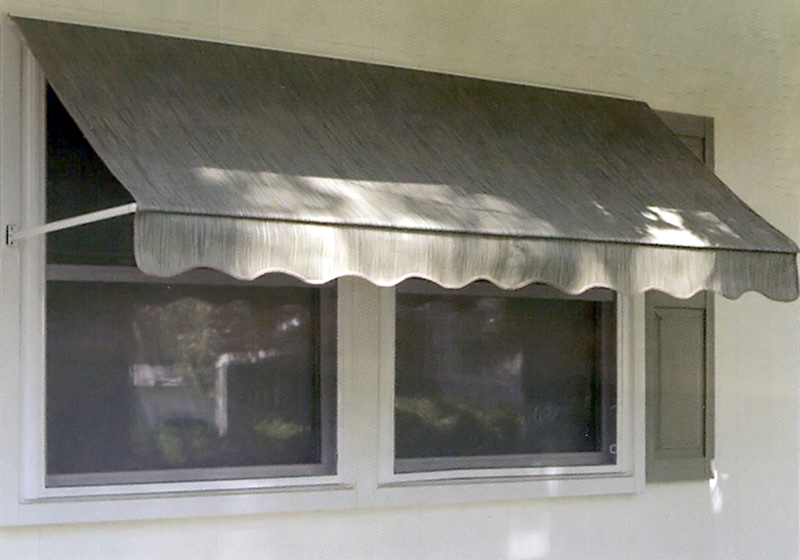 Rainbo window awnings are designed in the classic style of window awnings with a scalloped valance. One of the unique features about the rainbow series of awnings is the fact they can be made with either the tight weave Sunbrella awning canvas or with the open weave awning fabric called Textilene. The major differences between these types of fabric are that the Textilene fabric actually allows the light to come through the fabric due to its open weave while the tight weave Sunbrella fabric would be much more opaque although still allowing in a very small amount light. Many outdoor window shades utilize the Textilene fabric due to its open weave design and it makes a great fabric for awnings that may be in the more shady areas of the home. Both fabrics block up to 94% of the U.V. rays and both reduce the solar heat buildup caused by direct sunlight plus each type of fabric is backed up with a five year warranty. The Rainbo window awnings also incorporate an aluminum wall hinge and pull up kit allowing you to raise and lower these awnings in the event you need to retract them due to inclement weather or high winds. This series of window awnings are tailored from two feet in width out to eight feet in width and come standard sized at twenty-eight inches tall with a projection of twenty-four inches to fit most every window imaginable. Sunbrella Tight Weave Fabric: Filters out 94% of UV rays and does not allow light through but is water repellent. This fabric offers the look and feel of canvas but has the durability of acrylic.